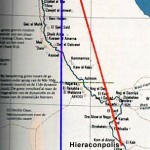 The red Observation-line connecting the prehistoric capitals Hieraconpolis and Buto is an imaginary line along which annual observations were made of the heliacal rising of the star Sirius; this obviously includes the intermediate settlements on the Nile. As a result of these observations, the Egyptians were able to determine the exact beginning of every new calendrical year. Moreover, between approx. 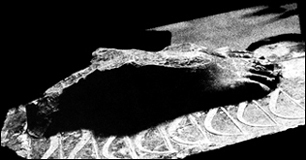 3,900 and 3,050 BCE, every first annual observation of this heliacal rising in Hieraconpolis was, after a recognized number of days, followed by the analogous observation in Buto. This enabled the priests to proclaim to the people throughout the whole of Egypt on which precise day the New Year was to be celebrated (see Subpage 1: Astro-geodesy and the Planological Infrastructure of Egypt). These locations would forever bear the name “Thronstätten” (regal residence) (Der Götterglaube im alten Ägypten, Kees, p.178) (fig 3a). 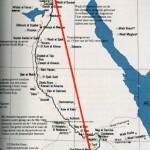 The blue Osiris-meridian runs from Abusir (30º55 N.), via the second Abusir (29º53 N.) – situated between the Red and the Bent Pyramid of Dahshur – on to the third Abusir (21º50 N.), which is located near the fortress of Buhen at a longitude of 31º13 E. Abusir means Per wsir, i.e. House of Osiris (fig 3b). 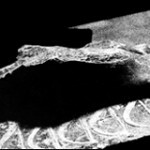 The meridian lies precisely halfway between Letopolis and Heliopolis and stretches from the 22nd to the 31st parallel, thereby covering the nine areas (9 parallels) that are generally known as the Nine Bows These bows were engraved on pharaoh Djoser’s statue, below the feet (fig. 3c). 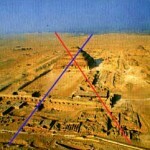 The blue Osiris-meridian was the meridian on earth and also the Observation-line of Midheaven (zenith). 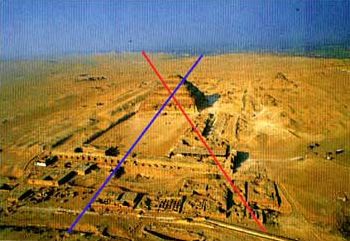 At the intersection of the blue Osiris-meridian with the red Observation-line between Hieraconpolis and Buto, the Egyptians built their first pyramid, the Djoser-complex (fig. 3d). This location divided the total length of the Observation-line according to a significant proportional ratio. Hence, the location had already been fixed by astro-geometry before the complex was built. The red line (fig. 3e) marks the locations between Heliopolis and Philae from which the heliacal rising of the star Sirius could be observed between approx. 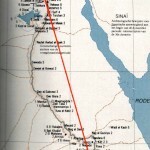 2,900 BCE and 525 CE (see Subpage 1: Astro-geodesy and the Planological Infrastructure of Egypt).